In September 1969, following recommendations of the Advisory Commission on the Development of Government in the Northwest Territories (Carrothers’ Commission), the Government of the Northwest Territories established the Department of Education and officially took over responsibility for schools and schooling in the north. The Territorial Government’s Department of Education continued the process, which began in 1955 under the Federal Government of expanding the day-school system and adding grade levels to existing community schools in the Northwest Territories. During the 1969-70 school year there were 10,291 students and 549 teachers in the Northwest Territories (including the present-day Nunavut Territory) and “it was assumed that … the goal of having every school-aged pupil in a classroom had finally been achieved.” Thanks to an ambitious expansion of day schools by the Federal Government in the 1960s most of these students were able to attend elementary grades in their home communities. But for many students continuation of their education meant leaving their families and their home communities. They had to attend junior high and high school classes at day schools in larger communities. Home boarding was arranged for some students but most were required to live in large hostels or ‘residential halls’ in Yellowknife, Inuvik, Fort Simpson, Fort McPherson or Fort Smith (see map). 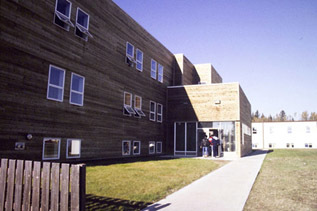 The Government of the Northwest Territories continued to build new schools and to add grade levels to existing community schools throughout the 1970s, 1980s and into the 1990s and there became less need for these residential ‘halls’. Some residences were closed, and others began to be maintained by local or regional school boards. For many, life in these hostels was difficult. Separation from family, friends, community and culture created numerous problems that our modern society is only today coming to grips with.